Our product range includes a wide range of metal bin. 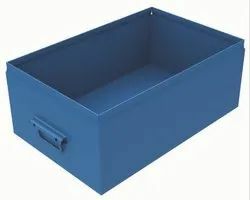 We are instrumental in providing our clients with a perfect quality Open Storage Box. The offered open boxes are widely demanded by our clients for their brilliant features. Our skilled professionals manufacture these open boxes using premium quality raw material that is procured from certified vendors of the industry. Moreover, these open boxes are checked by our quality examiners on different parameters in order to ensure their quality. Small in size suitable for storing of articles very small in size. Snout end design for accessing of material in stacked condition.